The beginning of November is the ideal time to start planning your company's holiday or end-of-the-year party. You may think you have ample time, but remember that the winter season is busy, not only for your employees, but for other companies as well. Don't wait until last minute to call a venue or caterer, or else you might end up out in the cold. Use these five tips to get ahead on your party planning and hold an awesome bash. If a holiday celebration is a tradition with your company, take some time to get feedback from past gatherings. Ask employees for their favorite and least favorite part of last year's event. You'll get valuable information on location, time, planning, food and drinks. After all, it's a party for your staff, so they should have input on how to celebrate. One of your first tasks should be to choose a date and time for the soiree, so spread the word that you've begun planning. Ask your employees to suggest potential times and list dates that are inconvenient for them. The SMC Conference and Function Centre suggested sending out a mass email with a list of potential dates and times for staff to review. At the end of the day, you want to pick a time that works for as many people as possible. You may not be able to accommodate everyone, but you can make sure that their input is taken into consideration. If you're planning on honoring any of your staff members, like with an "Employee of the Year" award, a holiday party is a great place to do it. Giving employees public recognition for their accomplishments will boost morale and make them feel appreciated. If you want plaques or awards to hand out, order them early. If you wait until last minute, you may not be able to get them customized the way you want. Some options that your staff are sure to love include the Crystal Number One Recognition Award and the Jade Crystal Scroll Recognition Award. Whether you're hosting a big bash or an intimate gathering, there should be some sort of entertainment. For bigger events, consider inviting a local youth group or church choir to perform, or have a karaoke machine. If one of your employees is part of a band, you can invite the group to perform. For smaller events, you might organize a few games for yours staff to play, like a Yankee swap, or have a visit from Santa. It's always a good idea to send out a gentle reminder about the standard of behavior you expect at company events. 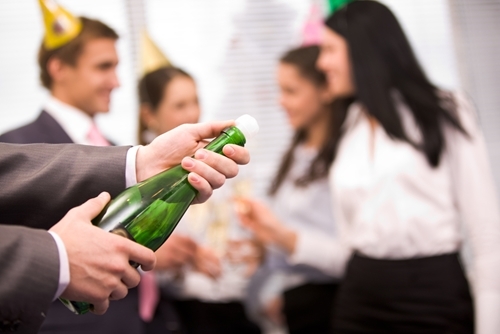 While the party is certainly a time for employees to relax and socialize with coworkers, they should be respectful and courteous. Send out an email detailing any actions that you consider inappropriate and how they will be handled. This is especially important if you are going to have alcohol at the event. You want your company to make a good impression on the community and any vendors you work with so take the time to remind your employees of the reputation they are expected to uphold. A company gathering is the perfect time to thank your staff for all that they do. Set aside a few minutes during the event to give a short speech expressing your gratitude. It doesn't need to be long or professional to let employees know they're appreciated. You might also want to give out thank-you cards, like the Extravaganza Personalized Holiday Cards, with a note for each staff member. A little thanks goes a long way when getting your employees in the holiday spirit.